The Garden Route has so much spectacular scenery and diverse activities to offer, that it is difficult to decide where to go and what to do. 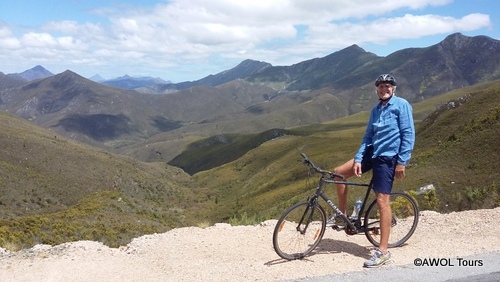 AWOL recently took four guests on a lovely Garden Route cycling tour and we showed them the most beautiful scenery along South Africa’s famous mountain passes. 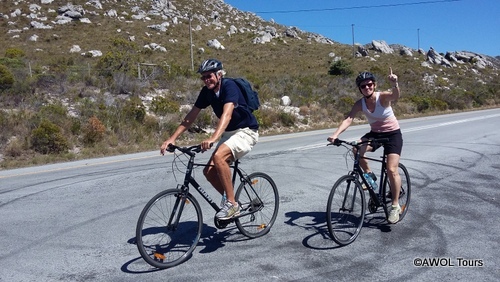 We started the tour with a pick-up in Cape Town and a warm-up cycle from Rooi-els to the penguins in Betty’s Bay, with some cyclists continuing the whole 60km stretch to Hermanus. Unfortunately the Southern Right Whale season was already over by mid-November. We ended the first day in Swellendam, the third oldest settlement in South Africa where one can admire some very fine Cape Dutch Architecture. 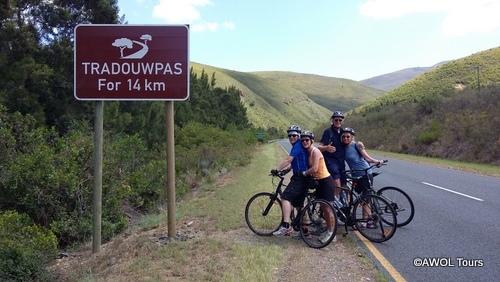 The next day made our way to Oudtshoorn via the Tradouwpass, which means “Women’s Path” in the old Khoi language. Why? 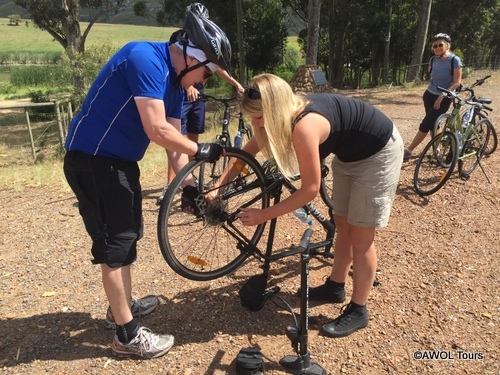 Some people say because it is a relatively easy mountain pass… which accounted for the one and only flat tyre that we had to fix, but well, that comes with the territory. Going down another mountain pass into Calitzdorp, was too much for our support vehicle and instead of a wine tasting in the Karoo’s port wine capital, we spend some time at a workshop – a great opportunity for our German clients to see how mechanics works in South Africa! And they spiced the whole experience up with their great Kölsche sense of humour. As weather did not play along the next day and due to rain we couldn’t cycle Meiringspoort, so we spend the day with wine-tasting and classical activities at the ostrich capital like a visit to the Cango Caves and to an ostrich farm. With a day of rest the legs were fresh to tackle the Robinson Pass the next day. This pass was also built by Thomas Bain, who is responsible for so many stunning mountain passes connecting coast and Karoo. From Nature’s Valley we cycled along the Bloukrans Pass (which is still closed for traffic) to Tsitsikamma National Park and drove back to our accommodation at Plettenberg Bay. From the pass you can watch bungee jumpers brave enough to jump into the deep from the world’s highest commercially operated bungee bridge. 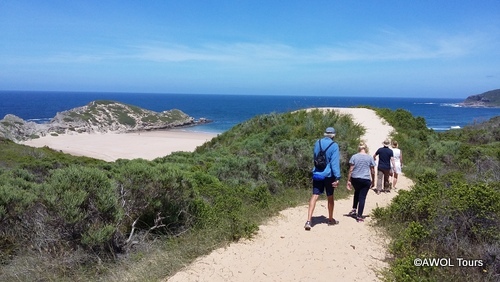 After a nice and easy walk on the Robberg Peninsula the following day, we made our way to Addo for a sunset game drive. 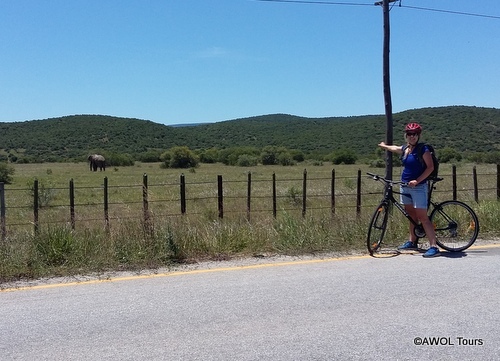 The tar road between the southern and northern sections of the Addo Elephant National Park allowed for a relatively easy cycle to Paterson and back. We did not only spot an elephant from the saddle, but also herds of zebra, eland antelope and some warthogs which accompanied us running a mere hundred metres from the fence – a truly memorable experience! Who else can claim to have cycled with a herd of zebra and eland? In Port Elizabeth it was time to say goodbye, but not before we had done a leisurely bike ride along the promenade. The great hospitality and helpfulness of all the locals we met, the stunning nature and amazing scenery left some memorable impressions not only on our guests, but also on me as a guide. We love to cycle the Garden Route, so if you are ready for a great experience send us an enquiry for a personalised Garden Route itinerary!